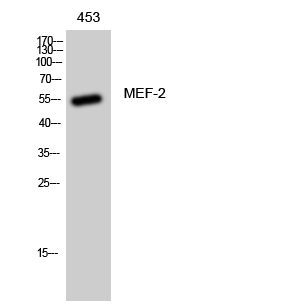 The protein encoded by MEF2A is a DNA-binding transcription factor that activates many muscle-specific, growth factor-induced, and stress-induced genes. 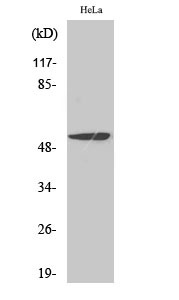 The encoded protein can act as a homodimer or as a heterodimer and is involved in several cellular processes, including muscle development, neuronal differentiation, cell growth control, and apoptosis. Defects in this gene could be a cause of autosomal dominant coronary artery disease 1 with myocardial infarction (ADCAD1). Several transcript variants encoding different isoforms have been found for this gene. 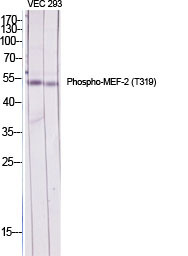 Phospho-MEF-2 (T312) Polyclonal Antibody detects endogenous levels of MEF-2 protein only when phosphorylated at T312.